Microsoft has updated the XBOX One platform to add support for HEVC! Streaming video services can take advantage of XBOX One’s HEVC support to deliver a massively better end-user experience at any bit rate. So, this article will help you to rip DVD movies to H.265 MP4 format for playback on Xbox One with the best DVD Ripper which utilizing CUDA speed up 6X faster dvd conversion. Let’s check it out! You may want to rip your large DVD collection and put the transferred files playback on Xbox One. In fact, the DVDs are usually hard to be backed up due to region code and disc encryption protection, and your precious DVD discs will be damaged due to repeated use or in other words, in and out the Xbox One’s DVD drive over and over again. To prevent your previous DVDs from damages and watch DVD movies on Xbox One freely, you need first turn to an Xbox DVD Ripper to help you rip and convert DVD to Xbox One friendly format. Here Brorsoft DVD Ripper for Mac is highly recommended to you.It has the most powerful crack technology. Both HD DVDs and standard DVDs can be ripped to all popular SD and HD (3D) video formats like 4K/1080P/720P H.264/H.265 MP4, MOV, MKV, M4V, WMV, FLV, AVI, 3GP, MPEG and more. Meanwhile Brorsoft DVD Ripper also provides the preset formats for over 175 hot devices (iPad, iPhone, Android,Surface tablet, Samsung Galaxy, Xbox, PlayStation, NAS, Panasonic/Samsung/Sony/LG Smart TVs/HDTVs/3D TVs). Simply select the profile to rip DVD for playback on your device with optimized settings and never worry about the video incompatibility! What’s more, the ripping speed of Brorsoft DVD Ripper is about 5-6X faster than competitor utilizing the most advanced hardware acceleration NVIDIA CUDA & AMD APP by H.264/H.265 codec, which can give users video transcoding speed than before. Step 1: Insert your DVD disc into your DVD driver and then launch the DVD ripping app to load your DVD movies to it. It also supports DVD folder import. Tip: You can freely select the subtitles for your movies as you like from the Subtitles option. Only showing forced subtitles is also available. Step 2: As we know, MP4 is the optimal output for Xbox One. 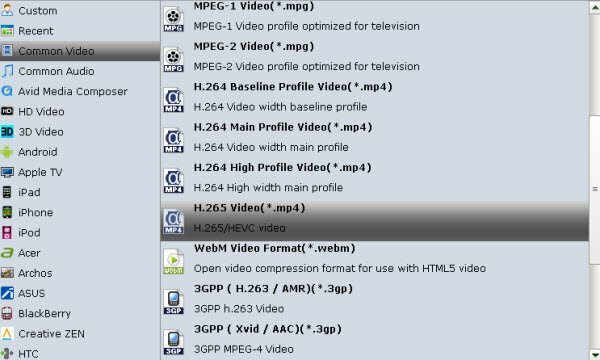 You can also choose H.264 MP4 from Common Video. Or select Zune/Xbox 360 Device > Xbox 360 Video(640*480)(*.wmv) as the target format. But Xbox One can support H.265 files directly, so you can select “Common Video” from the format list and directly choose H.265 MP4. Tip: Click “Settings” icon to adjust the video, audio parameters bitare, frame rate, sample rate, audio channel, etc. Plus, you can click “Edit” button to do some editing work cropping, trimming, settings effect, adding subtitles. Step 3. When all settings are done, simply click the Start button to begin the conversion from DVD to Xbox One. You will get the files converted ready in a few minutes. After the conversion, click Open to get the output files for your Xbox One. 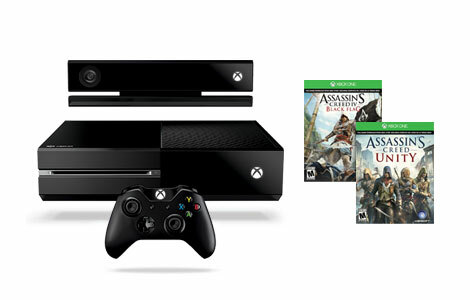 From now on, you can watch DVD on Xbox One freely. You need to click the settings and then enable acceleration options as below to speed up ripping processing. 2. Although Xbox One can support H.265/HEVC codec, it still has limit. Xbox One only supports HEVC 10-bit codec. Based on our testing, some H.265 files like in 12bit can’t play via Xbox One properly. To get rid of the trouble, a good suggestion is to encode H.265 to Xbox One more friendly format like WMV, H.264 MP4. For this purpose, the all-in-one Blu-ray Video Converter Ultimate program will be a nice choice for you. If you are running a Mac OS X computer, iMedia Converter Mac is the alternative.